The best things in life come when the sun shines bright, and if you wondering how to add more fun to you weekends then try out the brunching with your family and friends. Recently, we got to be part of some amazing food and art activity held at the JW Marriott New Delhi Aerocity. 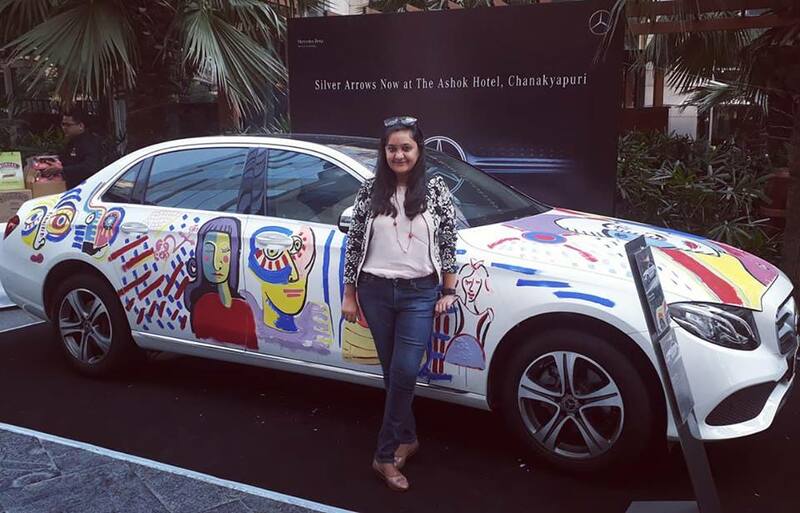 The event called ‘Art Brunch’ was conceptualized by food writer Jyotiee Balani, who hosted an arty afternoon in collaboration with Silver Arrows Mercedes-Benz. While the foodies lined up at the live-food counters in the newly opened Playground, the art lovers were enthralled to see artist Jai ‘Zaiu’ Ranjit in action as he painted on a Mercedes-Benz E-Class in his signature style. The artist told us that he has been doing the series of Art Brunch in different cities and for Delhi, he chose a colorful theme inspired by Picasso’s cubism to depict the upbeat character of the city. A treat for the eyes and picture-perfect backdrop for instant likes, isn’t it? As we savored the delectable art-inspired food prepared by the skillful culinary team at the hotel, we were spoiled for choice as almost 200 types of dishes were part of this brunch including a massive dessert display. After a hearty brunch and rounds of cocktails, we were invited by the hotel to be a part of the cake-mixing ceremony which was the most amazing part of the day because who doesn’t like to have some fun in the apron? The festive mood and cheerful spirit filled the atmosphere with joy and all the participants were asked to mix a total of 100 kilos colorful ingredients; fruits, raisins, glazed red cherries, orange peel, dates, nuts, and spices together with a variety of liquors. FYI, the final mixture is kept for around eight weeks and left fermented until just before Christmas time. Closer to Christmas time, sweet and sticky fruitcakes along with other delectable cakes and puddings are made using these ingredients. Anyhow, the super fun art brunch with friends and fellow bloggers ended with a memorable food memory that we will cherish for a long time. Till then, keep reading and write to us for if you want us to take you along for the next adventure.